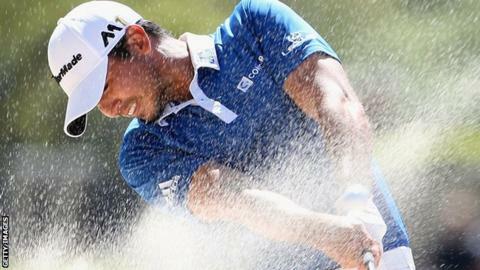 Jason Day beat Louis Oosthuizen to become WGC-Dell Match Play champion for the second time in three years. Day, who has also regained the world number one slot, dominated the final at the Austin Country Club in Texas to beat the South African 5&4. Earlier, Australia's Day, 28, beat defending champion Rory McIlroy one up in the morning's semi-finals. McIlroy went on to lose 3&2 to Spain's Rafa Cabrera Bello in the play-off for third place. Day's victory made it back-to-back tournament wins after he also won the Arnold Palmer Invitational last week and further aided his preparation for the US Masters in less than two weeks' time. Oosthuizen, the 2010 Open champion, won the opening hole of the final but Day was in front by the fourth and led by three holes at the turn. Birdies on the 13th and 14th then secured victory for Day, who joins former world number one Tiger Woods and fellow Australian Geoff Ogilvy as multiple winners of the event. Day said: "I'm very, very thrilled. It's been a memorable week, not only to win the Dell Match Play Championship but also to get back to number one in the world."